Have you ever heard that “leaders are born at events”? It’s an important part of having success in network marketing, so I made sure to be an “event promoter”. Spending a week in Vegas, as you know, can be pretty nuts, but this time it was not all fun and games. I was there to learn and network and we were in bed every night by midnight to be ready. The year before I had attended an exclusive event – strictly for leaders in network marketing who already make 6-figures or more per year in their business. I was going to show my wife Mari what’s been working, and get her involved in 6 and 7-figure conversations. There’s so much I could share with you right now, but in time, I will be sharing much of what I learned to those who subscribe to my bootcamp newsletter. For now, I’ll just talk about a few of the most important things we learned in Vegas. Real ‘Marketing’ means using real advertising, Facebook fan pages, laser targeting, blogging, email follow up, sales funnels, etc. Specifically “attraction marketing”, which focuses on building a loyal following online and creating a brand, where people know, like, and trust you. Over the years, I have seen many people build successful network marketing businesses using the internet, but the “fixed” leaders are still resisting the change. Now, standing in that room of 7 and 8-figure earners, were many people who had built their organizations partially or entirely online were acknowledged for their success. They all demonstrated that network marketing can now be done using internet marketing. I could see my wife starting to pay close attention when they all spoke, and we took tons of notes. This will be familiar to you , because I’m sure it’s prospecting you’ve already done. Prospecting on social media is far from “Internet marketing,” however it still beats chasing skeptics on the street. 1) SEARCH – Use Facebook Graph Search to find ‘friends of friends’ who live locally (at least to start with). You can also try the exact language of “people I may know who _____”, and look for ‘like interests’ or passions. First of all, Facebook lets you directly message ‘friends of friends’ , and it will send your message into their main inbox, instead of the “Other” inbox, which most people don’t even know how to access. (I barely found where that was this year, and had tons of messages people had sent me 2 and 3 years ago). 2) QUALIFY THEM – Next, it is important to invest the time to scan their profile and identify like interests that might resonate with you personally, or your business or your products. You’re looking for the subtle things that you can identify as a reason you’re getting in touch with them. Are they positive, sharp, professional, and smiling in their pictures? Are they go-getters? Outgoing? Do they look like a fun person to be on a trip with? We’re prospecting, but I make sure to qualify them, so I’m not wasting my time (or theirs) bringing in dead weight. You’re only looking for sharp people who are looking! So, there must be a specific “reason” you are getting in touch. People can sense if you’re using a “shotgun approach”, just trying to prospect anybody, and if you’re randomly messaging them, they can tell. For example, an interest in Robert Kiyosaki might indicate a genuine interest and understanding of entrepreneurship or diversified income streams. Do a search… “Friends who like Robert Kiyosaki” or “people I may know who like Kim Kiyosaki”. An interest in Fitness, Nutrition or Success Magazine indicates interest in health, wellness or success. They very well might resonate with your company’s products, or be open to opportunity… but only if approached correctly! 3) A GOOD MESSAGE TO THEM – Crafting your first message to them is the most important piece, and you must think about how YOU would want to be approached. You can follow a somewhat standard scripted fast prospecting approach, but if they’ve been hit up a few times from others, it won’t work. There’s a term we use: “Fast is slow. Slow is FAST”! This means, slow down, show them you care, and you’ll go faster. Your up-line may have templates, but I would fit each message for them specifically. Maybe mention friends you have in common, for social proof. If you want to ‘sift and sort’ faster and be less picky, you can look in their bio and find a specific reason to reach out, and go right into an invite and mention that you’re a professional recruiter for a ______, (or whatever the product/service is about), and they’re “expanding in your area”. You can throw the ball in the air and see if they swing back at it. You can also do the slower approach, (which I recommend), but DO NOT post cold spam to everyone, copying and pasting your (curiosity killing) messages with links to sign up for your opportunity! LOL! If you tell them ANYTHING about it, or try to explain “what it is” or convince them at all, they’ll automatically avoid you! LOL. What you want to do is be curious and interested in them, and after you know a bit about them and what they may have interest in, cause curiosity and try to get them to express an interest. Then, when they meet with you, have a smooth duplicate-able process that anyone can follow. Have a 3rd party do the heavy lifting. Either your up-line or a link. Remember: never leave an appointment without setting up the next one, so it’s never “up in the air”. This strategy, depending on your personality, may or may not be great. It’s not my favorite, and involves posting your “before and after” results on social media (i.e. setting the ‘mouse trap’) and waiting for people “like”, comment, or send you a private message! Also, if you’re not afraid of “asking for the sale”, you can add a CALL TO ACTION for them to message you if they’d like more information. In my experience, many people have grown immune to this approach, because so many people are out there doing it wrong on social media right now. I’m not really the type that uses this approach but I’ve seen it work. I personally don’t like this strategy ’cause it can repel your real life friends & family if they think they “know what it is”. But hey, let’s face it, most people have a desire for more income. Usually more “friend & company safe” is ‘leading with the product’ angle or “bottom up” approach, especially if the results you are posting has to do with some sort of case study. This will help you gain a customer base and a few of those customers may convert to the business side, after they fall in love with the product. We’ve seen this strategy go nuts with weight loss challenges & things in the last few years, which can still work. It can also work with other products or services, if there is a clear and visible result produced. You can also post pictures of yourself working out, hiking, triathlon, etc., which “wasn’t as easy without your certain supplements”. Then, once they express interest, practice what you’ve been taught for closing people. I believe 2015 was basically the tipping point for when Internet marketing (i.e. passive online selling, prospecting & recruiting) was finally legitimized as the force in network marketing. Pretty much every leader stood up at that event was saying they leveraged their businesses with Internet Marketing. However, when all of the 7-8 figure earners were asked to stand up and identify themselves, it was a defining moment and this opened Mari’s eyes, wide open! 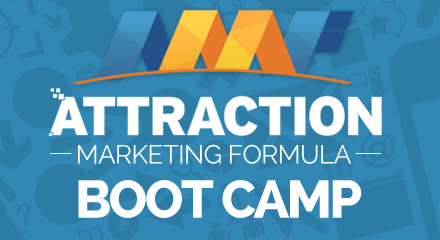 What they would all pretty much outline as a blueprint for their business was exactly what I’ve been teaching for years now, called ‘Attraction Marketing’. These folks didn’t message strangers all day and night like in Strategy #1 or #2. What you can do is market effectively, to create ways of making sure that when you wake up each morning, you will have messages, letting you know that there are 10’s or even hundreds of new prospects who are already interested in learning more about your product/opportunity. You’ll have 5 – 10 new CUSTOMERS waiting, and 5 or so new DISTRIBUTORS already signed up (while you slept), and waiting to be led! Now, if you look around, most businesses are now using proven, passive, scalable marketing & advertising methods online. So why NOT your network marketing business? The only reason would be if it wasn’t a REAL business. But you and I know better. You can learn more about it here, via my bootcamp. And like anything else in business, this will take work and study, but it will enhance your skill set, and move you into the 21st century. Are you ready for the journey? I’m looking forward to working with you..